It's a little known fact about Book Chooks that they've always yearned for a pair of polka-dot knickers. So, apparently, do pigs. 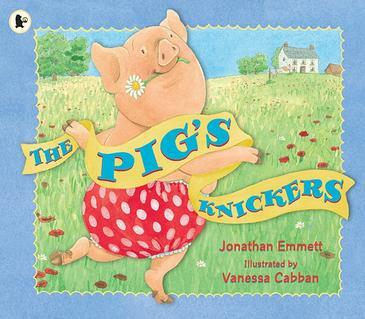 The Pigs Knickers was written by Jonathan Emmett, illustrated by Vanessa Cabban, and published by Walker Books (2010). It begins with Pig unable to enjoy the lovely day because he's sorry for himself. He feels drab and dull and wishes he looked special. A gust of wind blows a gorgeous red pair of knickers Pig's way. Those knickers transform Pig into a pirouetting, break-dancing, tango and salsa-ing gymnastical superstar. Or do they? Perhaps Pig was special even without his knickers? This is such a happy picture book! Young kids will giggle over the title, and continue giggling over Pig's antics. They'll love being able to act out the actions with Pig, while parents will appreciate the subtle humour of the story. There's lots of great language to discuss. Illustrations are simple, colourful and have lots of movement and action. All the animals have personality, and there are differing perspectives to give visual interest. Pig himself is exuberant, dramatic and laugh-out-loud funny. Guess which chook has a new favourite picture book?